ThinkGeek (stuff for smart masses) offer a wonderful range of gifts to suit all budgets, itemising their products either by price (select from gifts under $10, $20 and $50) or by type (geek toys, gadgets, home & office, computer stuff, caffeine & edible, electronics, geeks kids, books and t-shirts & apparel) and then organised into further sections. For me, part of fun of shopping here is their consistently funny product descriptions and accompanying images. 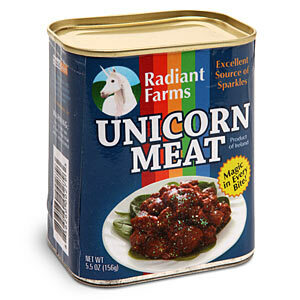 If you’re looking for something for a young female how about Canned Unicorn Meat? Girls love unicorns, right? They offer at least 28 bacon-themed products, a lovely selection of gifts for the kiddies in your life (searchable by age range), and within their clothing choices they have some interactive t-shirts which will attract all nubile females in the vicinity towards you, but be warned as it will probably also lure in the odd geek-boy. They also stock an excellent range of Star Wars themed goodies, including pet costumes, models of an AT-AT or the Millennium Falcon, Wampa rugs, the obligatory plush toys, lightsaber candlestick and Tauntaun sleeping bags, although the Han Solo in Carbonite Ice Cube Tray remains one of my firm favourite gifts to give. If you can’t find at least one thing on this site that you would like to either give or receive then you must have just worked a 18-hour shift and not be focusing too clearly, because this site is great. They also offer a system called Geek Points, where each purchase you make earns you a certain amount of points which you redeem once you accrue enough to buy something for free. They’ve recently changed their shipping method to go via UPS then USPS, which has caused some issues when tracking overseas orders, however all items invariably reach their destination, and their customer service is excellent.